Living in places like Germany, Jamaica and Guatemala, where there was a critical shortage of Greek people, my mother and father were hard-pressed to find ways to share their Greek heritage. None of these places were home to Greek Orthodox churches, so my family worshiped in fits and starts wherever there was a cross on the steeple and an English-speaking pastor. 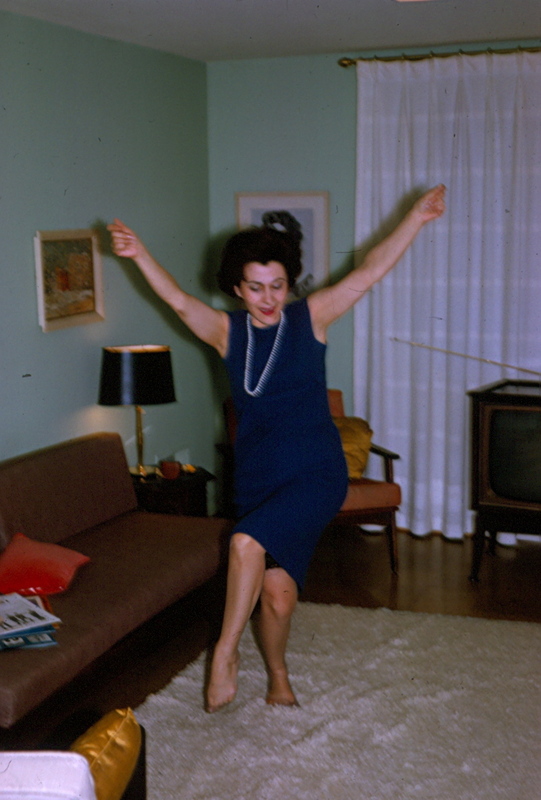 At my parents’ frequent parties, while guests were treated to an assortment of canned things on crackers and a steady flow of liquid treats, it wasn’t unexpected to suddenly hear the wailing tones and primal rhythms of Greek clarinets and bouzoukis as martini-bolstered Mom surprised the gathering of staid diplomats and steely policy-makers with her fierce version of a belly-dance. Belly dancing wasn’t really a Greek thing, but after 400 years of Turkish occupation, the Greeks adopted it, Mom pled ignorance, and since none of the guests were Greek or Turkish, it didn’t really matter. What did matter, however, was what my cringing dad and my little self (hiding in my nightgown at the top of the stairs) knew was coming next. Hollering, “But wait! Look what else I can do!” my laughing mother, with the springing agility of a circus poodle and the giddy unselfconsciousness of a happy toddler, stood on her head. failed to come: the headstand with the skirt and slip falling around her face. Great memory!! I can just imagine all of this! And, yes, I can see you at the top of the stairs–especially at the headstand! I’ve missed your postings! They are so much fun! Loved the posting! The photo of your mom is truly iconic! How well I remember her famous head stands! Woo-hoo! Another demonic retrieval! Crazy funny! I’ve missed your posts. This one is perfect! Great post, Susan. You have a knack for bringing us all back to a special place in time. 15 Dec 2012 at 7:49 pm Joyce M.
I think I would have liked those parties!